Bottom Line: We are called to encourage one another. Our words can either build up or tear each other down. Encouraging Christian music to play for the group. Envelopes and postage to mail letters to absent students. Our prayer is that this lesson will grow into a ministry of encouragement for your students. Take time before the lesson to write down the names of the students in your church, even and especially those who might not be active. Write one name per page which will be passed around to the students in the group to write words of encouragement to the person named on the sheet. Prior to the lesson, write words of encouragement to each student on the sheet to give you a chance to think and pray about the words that you share with each student. Pray for each student as you write on their sheet. Write a letter of encouragement to your group to read out loud. Look to the letter that Paul wrote to the Philippians as you pray for your group and pray that God would lead you in words to write to encourage them. Make the letter personal and affirming, pointing out the strengths that you see in the group. Say: How many of you have been to a game with cheerleaders? What are some of the cheers or phrases that they say to encourage the team? Write their ideas down, and add any others such as “You Rock!”, “Way to go”, etc. Ok, we are going to use these cheers in this game: Cheerleader Huddle. Let’s get in a circle, and I need one person to volunteer to be the first cheerleader. Your challenge is to go to each person in the circle and yell out, cheer out, or whatever you need to do – using one of these phrases to make someone in the circle smile. Circle – your challenge is to NOT SMILE. Cheerleader – get creative, but you cannot touch the person you are cheering to. Be funny, be serious, do a cartwheel, just be creative to make them smile. If someone smiles, then they become the cheerleader. Then, go to the person beside them to the left and go around the circle trying to make someone smile. If you go around the circle and no one smiles, choose another ‘cheer’ and maybe add a tumble! If you find that a student struggles to make anyone smile, nonchalantly join the circle and relieve them by smiling or maybe talk to some of your other leaders beforehand to help those who struggle out…for some introverted students, this activity could be very stressful. Which cheer was the toughest to not smile through? What methods seemed to work the best to make someone smile? Which cheer did you like the best? Which phrase would be a phrase that could really encourage you and why? You might have guessed that today we are going to be talking about cheering one another on, or encouraging one another. Raise your hand if you can remember (almost word for word) a time that someone said something harsh to you that hurt you. Leader could share at this time a personal story in which the words of another stuck with them in a negative way. Allow the group to finish the phrase. But, think about those words that have been spoken to you that still sting. They hurt and they can stay with you for days, weeks, or even years. It is a sad reality that there are many people who still carry the scars of words said to them as little children as adults. Words that the person who said them probably doesn’t even remember saying. Our words to one another really do matter more than we can realize, and that is why today’s lesson is so important for our group. I want you to think about a time when you were really encouraged. Maybe someone said something to you that has stuck with you, and encourages you. Invite them to share these instances and be prepared to share a personal story in which you were encouraged. We seldom realize that our words really do make a difference, both for good and for bad. Paul was an apostle of Jesus who spent his adult life encouraging Christians. How do you think Paul’s words made the Christians in Philippi feel? I want to read you a letter that I think will encourage you. Read the letter that you wrote to the group in your prep time. God made us for community and far too often we forget to encourage and lift one another up. We forget to tell each other that we truly thank God for each other. 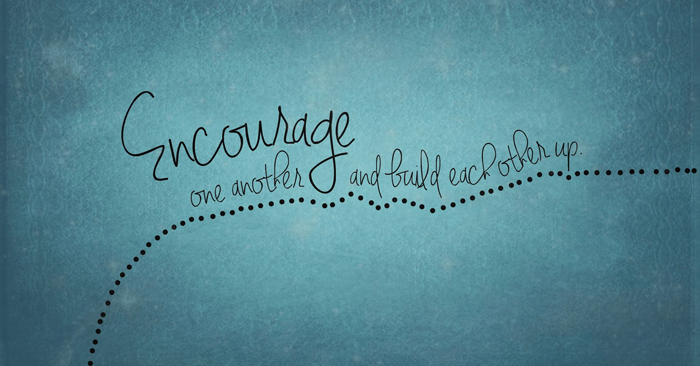 There is something really powerful that happens when we say or write words with the purpose of encouraging each other. Don’t just assume that others know how you feel, but let them know the talents and gifts that you see in them. As our scripture said, “do this as the day draws near”, which is a way of saying that we never know how much time we may have to bless one another. Take the opportunity today to encourage one another. I have sheets of paper that have each of your names written across the top. We are going to take time today to encourage one another. Have the group sit in a circle and if possible sit around tables. Write a word of encouragement to the person named on the sheet and then pass that sheet to the person on your right and just keep passing. This isn’t the time to write things that you might think are funny but could hurt someone. Try doing this: As you get a paper, pray for the person at the top of the paper. Ask God to help you to write something that He loves about them. Write about how you see God shine through them or something that makes them special. Really try to avoid writing things like “You are cool” or “I like your hair”, but rather really pray about how you can say something that will encourage this person. You could draw a picture, if you are more creative and prefer art over words. And if you find that you want to write more, know that this might be just the beginning of you really taking a step to encourage others. Write thoughts to each person today, but then feel free to go home and continue encouraging one another in creative ways. Hopefully, this encouragement will last well beyond today. Start circulating the papers and play some encouraging music for the students as they write. Once everyone has completed their writing, pass the papers out to each student and let them know they they can read them whenever they prefer. Mail the papers to those students who are not present and take this as an opportunity to let them know they are important and thought of. How did it feel to read the words of encouragement on your paper? Which words stick out to you most? Why do you think encouraging others is so rare? Who is someone in your life that you can encourage in this way this week? Challenge one another to choose 3 people that they can encourage through writing a letter, a text, an email, etc. over the next week.